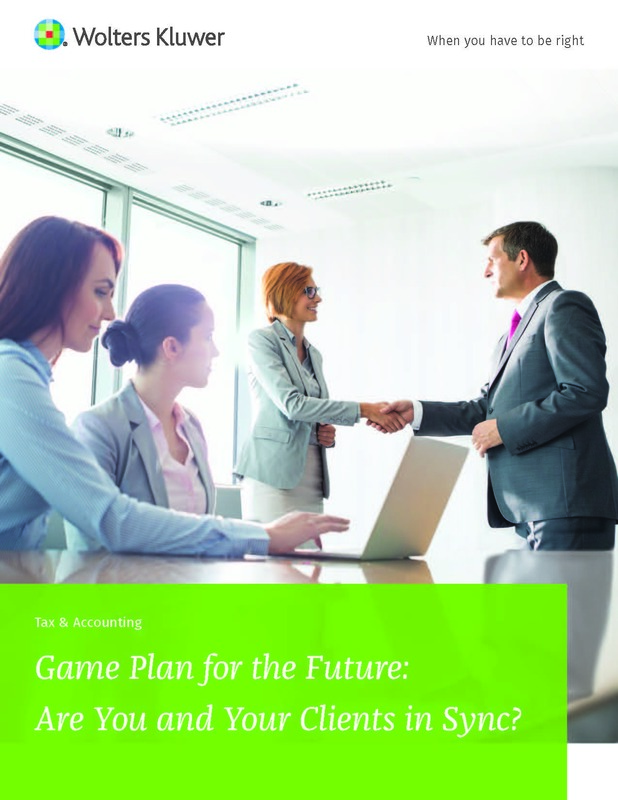 Game Plan for the Future: Are You and Your Clients in Sync? What do your clients really want? What is most important when they are selecting an accounting firm? And what makes them consider leaving and looking for a new firm? This latest white paper walks you through why firms with satisfied customers expect an average of 7% improvement in revenue over the next year, while firms with dissatisfied clients actually predict their revenue to decrease by 11% over that time frame. In that hunt for client satisfaction, firms that recognize technology as a way to grow their business and have invested in an integrated end-to-end solution see a significant impact, with higher satisfaction ratings from clients (81%) versus clients of firms that do not use an integrated end‑to-end solution (66%). This white paper will also provide you with the key strategic priorities that successful firms have mastered so you can win with your clients. By studying the different components that lead to a satisfied customer, you can create your own game plan for success. Fill out the form below and we will email you your white paper.